When the Armistice between France and England came to an end in 1803, Napoleon interned ten thousand British tourists who were in France at that time. Most of these tourists had committed no crime and had simply been travelling when captured. Many, to save being arrested went into hiding, among them the widow and daughter of Sir Edward Waltham, who had died that winter. A year later, plunged into poverty and the seedier side of Paris life, beautiful Vernita Waltham is keeping her sick mother precariously alive on the money she obtains from making exquisitely embroidered lingerie for a famous shop that supplies Napoleon’s sister, Her Imperial Highness Princess Pauline Borghese. Vernita discovers the shop is cheating and desperate to raise money for food and medicine, decides to approach the Princess directly with a negligee she has just finished, disguised as a petite bourgeoisie. 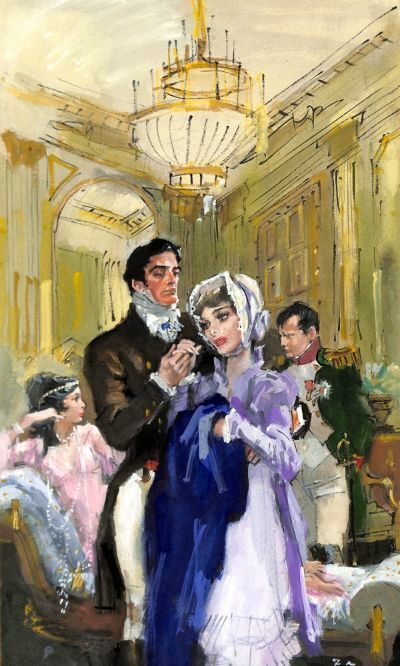 Extravagant and self-obsessed, Princess Pauline is enchanted with Vernita’s skills as a needlewoman and convinced that the silk and lace creations will only enhance her reputation as the most beautiful woman in Paris. She immediately determines that Vernita must move to the Palace and join the legion of servants that already pander to her vanity. From that moment on Vernita is thrust into complications with the Princess’s lover, handsome Count Axel de Storvik, and the all-powerful Emperor Napoleon himself. Unsure of whom to trust in a Palace filled with secret assignations and political intrigue, Vernita soon finds herself in a position that could ruin her reputation for ever. But how long can an English lady of quality remain hidden amongst the loyal family and servants of the enemy French Emperor? Terrified of discovery and fearful of the future, Vernita dreams of escape and a return to her home in England only to find an ally, waiting like a guiding star, in the most unlikely of places.